2. Meetings will be held on the first Monday of every month in summer and weekly during the race season. The board meets at 7:00pm and the regular meeting starts at 7:30pm. 6. All persons will sign in every race day upon entering the pit. Drivers will a draw a number for position and donate to the plow fund. 7. 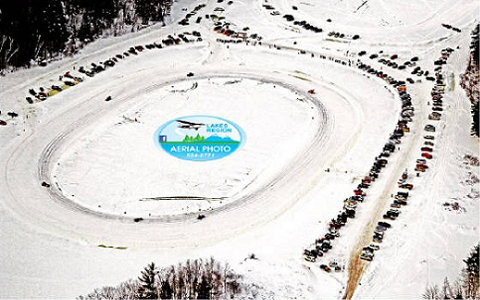 Races will be held every Sunday at 12:00 pm (weather and ice permitting). There must be 12” of ice for races to proceed. Pit Meeting will be at 11:30 noon every race day. 8. Membership dues is $30.00 per person, per season if paid by 1st meeting in August. After August meeting it will be $50.00 per person, per season. A person may race for $20.00 per event without joining the club. Registration fees for special races will be announced. 12. No drinking or possession of alcoholic beverages or drugs in the pits on the track or at the meetings. Anyone not following club rules pertaining to drinking or drugs will be suspended for one calendar year. This rule will be enforced by members, officials, and officer on duty. 15. Car numbers will run from 00-99 in the stock class, modified class and all four cylinders together. The drivers who had a number in the previous racing year will have first choice on keeping that number for the following year. Numbers will be at least 2” by 18” high and legible. Contrasting colors must be used, letters will be allowed as long as they are no more than ½ the size but they will not be considered part of the car number. No light colored cars allowed – at pit stewards discretion. 17. Cars may run in one class or the other, if they meet the rules in that class but not both in the same week (with the exception of the Junior Class). 18. All members are permitted to vote on their class rules only and must be present. They forfeit that right by not showing up on a work day by 10:00am. You loose the right to vote for one calendar year from the date of the infraction. Helpers must stay after the races for cleanup. Any registered driver that has competed in a heat, consi, or feature race that year except for special races, may not run in mechanics or officials races. 19. Board members are responsible for registering drivers on race day if the secretary or treasurer are not there. 20. No four wheel drive vehicles in any class. 21. All cars must be self starting. 22. All cars must have a loop chain front and rear secured to the frame, with the exception of the modified class. 23. Any club member or pit crew causing a disturbance at any club function will be suspended for not more than one calendar year. 24. Digging holes in the track will not be tolerated; suspension for the rest of the day and the following week will result. 25. The club must vote on all purchases over $500.00. 26. 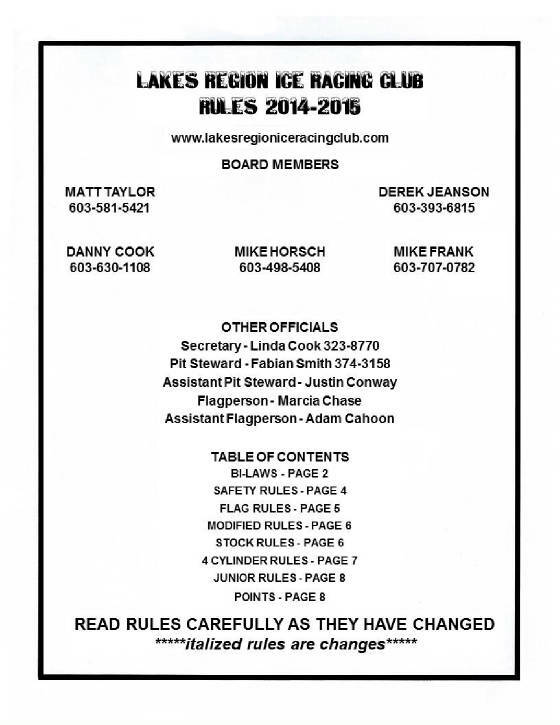 When a motion is made to end the racing year, all membership dues paid after that motion will be for the next year. 27. Meetings will be held in an orderly fashion. Only one person will have the floor at a time. 28. All cars must have a plastic sled identified with their car number under them to catch any fluids that might drip from the engine and will dispose of properly. Driver and crew are responsible for keeping area clean. 29. Any member found using a club track on a non club function day will be suspended for no more than a year. 30. Previous years members will vote in the class they were in the previous year. Juniors moving up new members will choose a class to vote in the current year. 32. The decision to close the season will be made no sooner than March 15th. 33. Mechanics races to be determined no later than the 2nd feature by board members on race day. 34. Must have 2 scorers per week, one scorer will be chosen from the helpers each week. 35. No 2 way communication radio’s for drivers allowed. 36. At pit meeting each race day you will be told how many laps will be run for each race. Ice conditions and car count will be taken into consideration by board members and flag person. 37. On race day at Berry Pond an adult (18 or older) is needed to direct traffic when races are finishing. 38. Each week helpers are to wear green vests and board members and track officials are to wear orange vest FOR THE DAY. 39. No spray foam used in race cars. 6. Racing type harness’s are required in all classes with a minimum of a 4 point hitch (if any questions please ask for a diagram of proper installation). Harness must be in good working condition, sub strap strongly suggested. 11. No racing backwards on the track. 16. All cars must have an adequate bracing on/in the drivers doors (NO LESS THAN THREE BARS OR LESS THAN 1 ½” OD STEEL PIPE OR EQUVILENT OF AND MUST BE APPROVED BY THE PIT STEWARD. 2 point overhead roll bar. Roll bar padding strongly suggested. 18. All cars must have at least two (2) excellent working brakes at Pit Stewards discretion. 19. No homemade contraptions, studded tires on drive axel only if approved by 4 out of 7 board members and pit stewards. 20. All doors must be securely chained or welded shut. 21. No sharp edges on nerfing bars or bracing. 22. Window nets are mandatory for all classes except modifieds. 23. No spectator cars in the pits. Club members are expected to enforce this rule. 24. No rear view mirrors allowed. If there is one it will be taped up by an official. 25. No Aluminum wheels allowed in modified or stock class. allowed in 4 cylinder class. 26. All drivers must have raceceiver radio or scanner. 2. FLUORESCENT ORANGE - CAUTION: Shown by corner persons: Shown by flag person: stop racing, return to the flag stand single file to be relined up. All cars that go into pits under orange will start at the rear. If there is a caution before one lap is complete by all cars there will be one complete restart except for the car or cars that cause the caution. The Flagman has the discretion to allow up to 3 laps under caution. Any car bringing out 3 cautions will be sent to the pits for the rest of the race. at the flag persons discretion. 8. TWO FLAGE (NOT FLYING): signifies two (2) laps to go. 10. Corner person will come under flag person’s words. 1. At the beginning of the year if enough sprint cars and modifieds show up to allow 2 classes we will split them. with a minimum of 4 cars in each class. 2. Over the counter chain only. Any experimental traction device must be brought to the boards’ attention on the Monday previous race-day for the boards’ approval. 3. Must have full roll cage frame and full frame, (pit steward discretion). 4. Bottom of front and rear bumper must be 20” high. 5. All cars must weigh a minimum of 1200 lbs. 6. Drive wheels must have a manufactured 3/16” center section thickness, approved by pit steward. 7. Must use 1” wheel lug nuts. 8. Must run SIERRA or equivalent coolant. 1. Any stock car fuel injected or carbureted, six or eight cylinder or half ton pickup (El Caminos and rancheros included). 3. Engine- Single 2 or 4 barrel intake and carburetor, maximum 750 cfm. Rule definition: A) Owner must prove to the pit steward anything in question. B) Owner has one (1) week to prove component is stock. C) Loss of trophy plus one (1) week suspension. Headers or cast iron manifolds allowed. 4. Must have over the counter automotive chains. V-Bar chain only on drive axle. Cross-links up to 1 ½ ton. Roller chains are allowed. No homemade chains. 6. Factory stock steel wheels no wider than eight (8) inches and not wider than three (3) inches from tire chain to frame (front and rear). After market steel wheels are recommended but are not mandatory. 7. Tire tread width is limited to nine (9) inches must fit within the club tire gauge. 8. Nerfing bars are allowed between front and rear tires only. Pipe must not be larger than 2” O.D. Bars must be as flush as possible with a limit of two (2) inches outside from inside of the tube to the outside of sheet metal in stock position. Pipe must be rounded on both ends. NO SHARP EDGES. 9. Stock appearing bumpers, front and rear. Reinforcements allowed behind face of bumper. No rough edges. 10. All hoods and trunks must be securely fastened. 11. Must use 1” wheel lug nuts. 12. Must run SIERRA or equivalent coolant. 13. Can use heavy duty rear end with the exception of quick change rear ends. 1. At the beginning of the year if enough FWD's and RWD's show up to allow 2 classes we will split them. with a minimum of 4 cars in each class. 2. Any 4 cylinder engine, front or rear wheel drive. 3. Body, frame and engine must match, Saab-Saab, Ford-Ford etc. 5. Stock appearing bumpers, front and rear. Reinforcements allowed behind face of bumper. No rough edges. 6. Fenders may be trimmed for clearance but not excessively. 7. All doors must be welded or bolted shut. The drivers’ door will not be cut down. 8. Floor boards are mandatory inside the car. 9. Only one shock per wheel. No air shocks. 11. Any over the counter chains are allowed up to one (1) ton. 12. Roller chains are allowed. 13. Any tire allowed, but not wider than seven inch tire tread. 14. Any wheels and chains may be spaced no wider than two (2) inches outside original body line in order to clear struts (in a safe manner) at pit steward’s discretion. 15. Engine-external engine must remain show stock. Rule definition: A. )Owner must prove to pit steward anything in question. B.) Owner has one (1) week to prove componet is stock. C.)Loss of trophy plus one (1) week suspension. Can run aftermarket carburetors up to 350cfm, 2 barrel with any air filter. Headers allowed. 16. No turbo’s, super chargers or rotaries allowed. 17. Engine must be in stock location. 18. Must run SIERRA or equivalent coolant. 19. Any rear end acceptable with the exception of quick change, fitting to configuration of body. 4. Any four cylinder front or rear wheel drive car meeting all safety rules and 4 cylinder class rules. 1. Only club members are eligible for points. All eligible drivers will receive 5 points at sign in, if signed in by 11:30 p.m. Car must pass through tech to receive the 5 points. 2. Line up: Draw for heats. First week only, draw for feature. The rest of the year we line up features by points with low point drivers to the front and high point drivers to the rear. Previous weeks feature winner goes to rear of point drivers. Non members, go behind the point drivers. Lathckey will stay the same with drawing for the heats and features. 4. Any member who participates at Sandwich Fair by working at least 3 hours at the booth or contributing a raffle worth $25.00 will receive 10 points. Members must sign up prior to fair with club secretary. Or new drivers can donate a $25 raffle to the banquet by their second race. 5. No points on any special events. 6. There must be 3 point races in order to declare a season champion in each class. 7. Must make one full green flag lap to get points or trophy.